A few months ago I posted a go fund me about my friend Adam and his son Grayson. 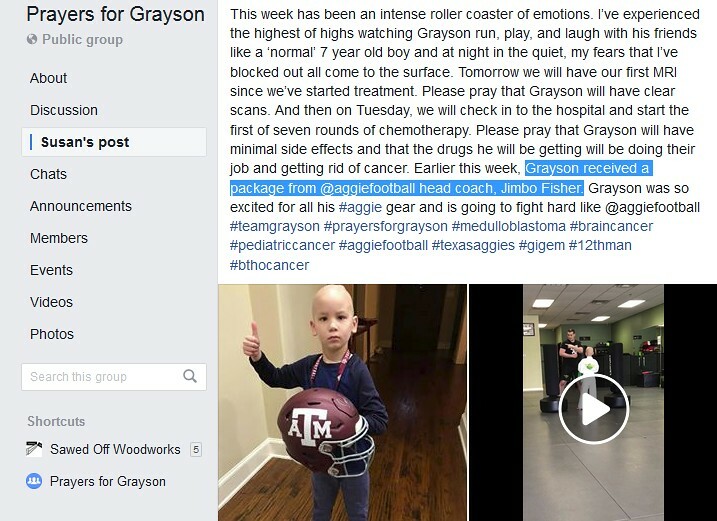 Grayson is 7 years old and has/had brain cancer. Jimbo and his staff sent an Aggie care package to Grayson last week. Good freaking bull Coach and Gig'em! I'm at a loss for words that you would take time out of your schedule to do this for him. You are a class act all the way. Seriously though. 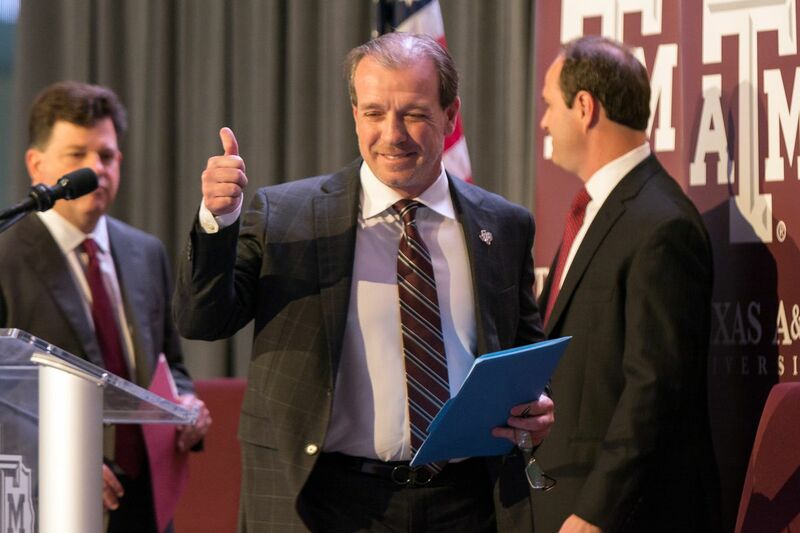 Coach Fisher is an Aggie at heart. What the hell took him so long to get here? Solid gig 'em from your boy. 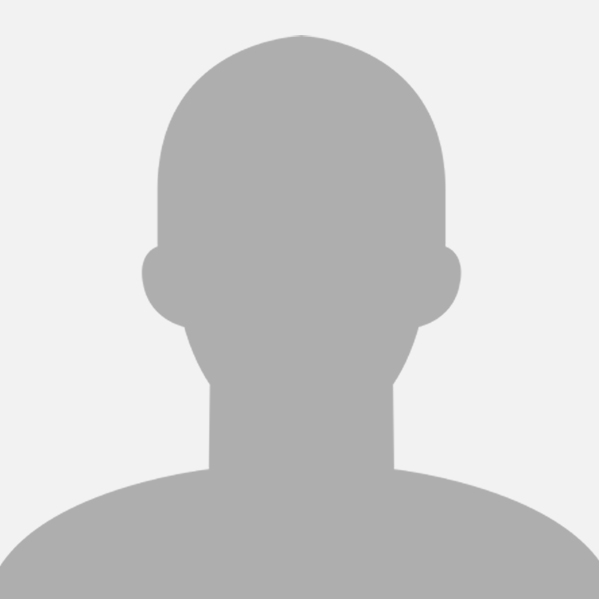 Is he cancer free now? It's my friend's son. And, no it's not over yet by a long way. The scans have been good, but he's been in a hell of a fight for him and his family. The OP is the best post in all of TA! BTHO cancer young man!! God Bless and Good luck to the young man ! GIG'EM AGS. One Game At A Time! Keep fighting son, keep fighting. May God bring you healing and peace. Prayers for that little dude. Why can't only criminals get cancer? Awesome. I just showed my seven-year-old, who used to go to school with Grayson, that picture and his eyes got so big seeing Grayson holding that A&M helmet. He couldn't believe it was a real A&M helmet. And for the update. I've been wondering how Grayson was doing. Prayers he fully recovers and gets back being a kid. Aggie Band not the easiest but the Best. If you follow his FB page they posted an update on Friday. He's in the hospital trying to fight off an infection. Kid has been through hell this year. That's such good bull. Great job, Coach Fisher. Good luck to Grayson. No kid should ever have to endure something like that. Keep fighting, son. Thanks for posting and continued prayers for Grayson, the warrior. My son is currently battling brian cancer too and he just turned 11. When people like Coach Fisher leverage their status and do this kind of thing it means so much to the kiddo (and parents). That young man Grayson is a WARRIOR. That my AG friends is DAMN GOOD BULL!! Really sorry to hear that. Is it the same kind?